The participatory sing-along highlighted the importance of cultural work and aesthetic experience in the development of Strike Debt. It segued into a report-back from a small team working on the People’s Bailout. 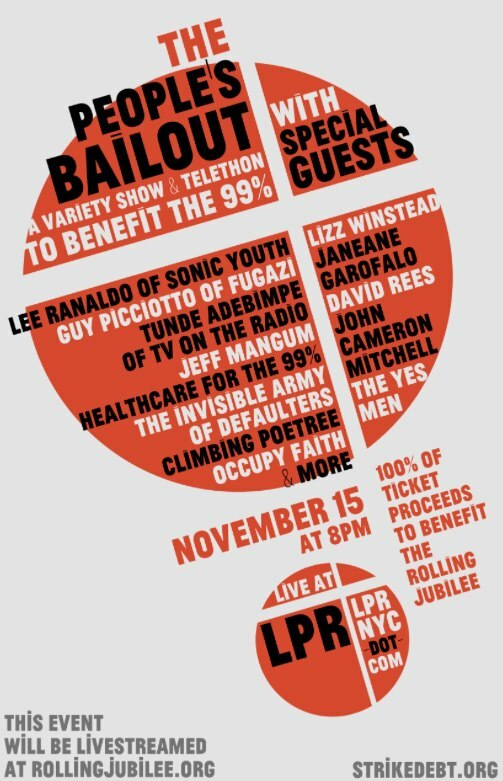 The People’s Bailout is a high-profile cultural event scheduled for November 15 at the West Village club Le Poisson Rouge. Details of the event are being withheld in advance of a strategic media rollout, but here is what we know so far: appropriating the kitschy Americana format of the Telethon variety show — think Jerry Lewis — the People’s Bailout will be a hybrid multimedia spectacle combining music, comedy, performance, speed lectures, video projections, global live-streaming and more. Poster by Strike Debt Portland, from the Strike Debt Facebook page. The event has already received coverage from Pitchfork, Rolling Stone and Spin for featuring headliners such as Jeff Mangum of Neutral Milk Hotel, Lee Ranaldo of Sonic Youth, Guy Piciotti of Fugazi and Tunde Adimpe of TV on the Radio, alongside non-musical entertainers and artists such as Lizz Winstead of The Daily Show, comedian Janeane Garofalo and David Rees of Get Your War On. Woven among these celebrity voices will be presentations and performances by groups allied with Strike Debt such as Occupy Faith, Healthcare for the 99% and the Yes Men. The Rolling Jubilee is a bailout of the people by the people. We buy debt for pennies on the dollar, but instead of collecting it, we abolish it. 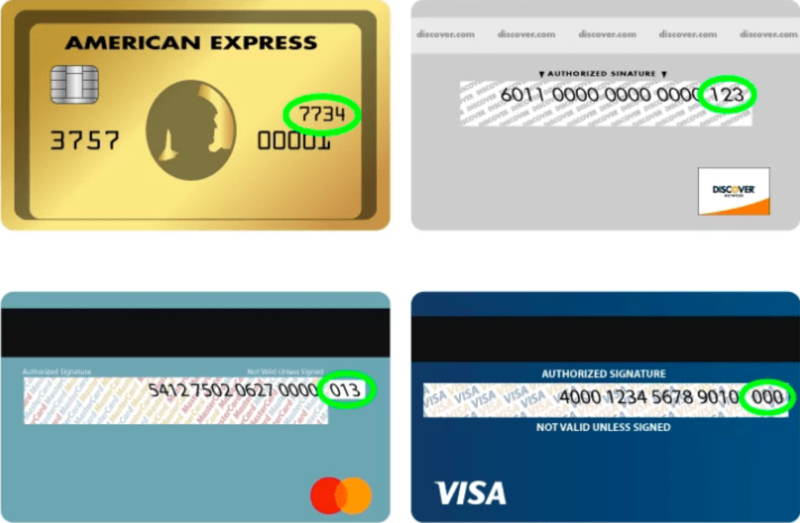 We cannot buy specific individual’s debt — instead, we help liberate debtors at random through a campaign of mutual support, good will, and collective refusal. “Banks got bailed out, we got sold out!” is among the most enduring chants of Occupy Wall Street, and it speaks to the basic impetus for the movement that sprang up last fall in Zuccotti Park. In the aftermath of the global economic crisis of 2008, government policy was overwhelmingly oriented toward shoring up the financial institutions that had precipitated the meltdown rather than helping the majority of the population suffering from its effects — foreclosures, layoffs, service-cuts, fee-increases, and a deepening hole of personal debt for basic human needs like food, healthcare, education, shelter and transportation. The figure of “the 99 percent” emerged out of this chasm between received ideals of democratic governance and the sobering reality of a political system rigged to support the profits of banks over the lives of people — despite the promise of “change” made by Barack Obama. Some appeals to the 99 percent over the past year have focused on repairing the actually-existing system through campaigns targeting the corporate lobbying complex exemplified by the Citizens United decision, for instance. 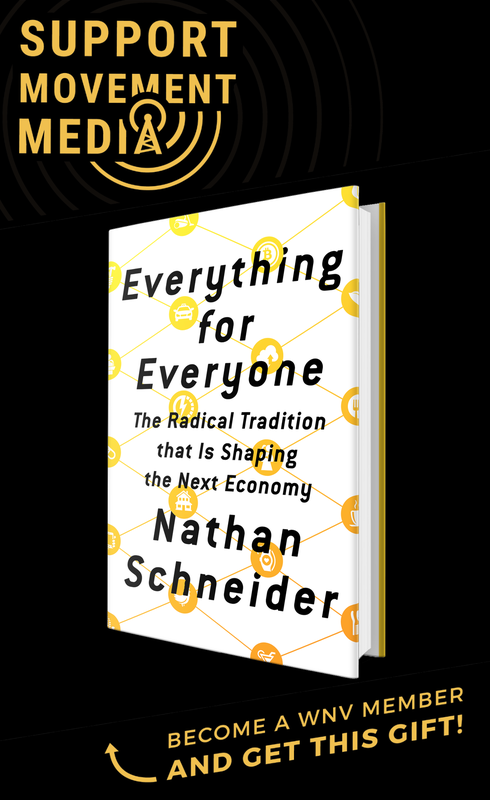 However, many organizers in OWS have always seen the crisis as a window of opportunity to rethink political and economic life more deeply through a process of education, creativity and experimentation with new forms of living. It is thus no coincidence that arts and education have played a crucial role in the evolution of Strike Debt. Exemplary in this regard is the work of Strike Debt organizer Thomas Gokey, whose isolated artistic experiments with debt purchasing laid the groundwork for what would be collectively transformed by Strike Debt assemblies into the Rolling Jubilee project. From the Strike Debt Facebook page. The occupations last fall were a crack in the system, unleashing the political imagination. Strike Debt aims to deepen that crack, calling for us to imagine actively refusing compliance with the power of creditors over our lives. Significantly, the launch of the Rolling Jubilee falls on the one-year anniversary of the eviction of Zuccotti Park; while the work of Strike Debt has taken a very different form than physical occupation, since its start last summer it has channeled and refined the principles of direct action, mutual aid and dual power that were at the heart of the original camp. A key date in the overall evolution of Strike Debt was the OWS one-year anniversary held in New York from September 15 to September 17 — conventionally referred to as “S17.” From the beginning of the S17 planning process, Strike Debt was always averse to fixating on a single day of action — especially one that ran the risk of appearing too circular or self-referential relative to OWS. Instead, S17 was approached strategically as a nodal point in a widening network of organizing and escalation for the fall. 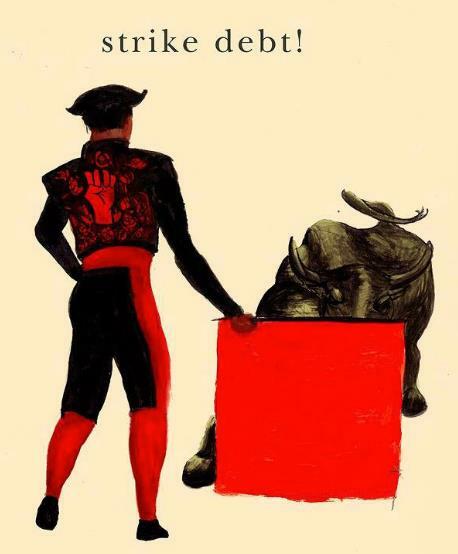 Strike Debt members planned their participation S17 as a nonlinear feedback loop in which the media visibility of the anniversary would both highlight past work and point forward. Strike Debt began its expanded fall sequence of “Year II” activities with a speak-out and debt burning in Williamsburg a week prior to the S17 convergence. Having people gather and burn their debt statements together has become a signature ritual for Strike Debt — a replicable action-logic that is amenable to scaling up, moving around and being creatively transformed in new contexts in a manner similar to the occupation itself last fall. In recent weeks, debt-burnings have taken place across the country in cities including Portland and Minneapolis. 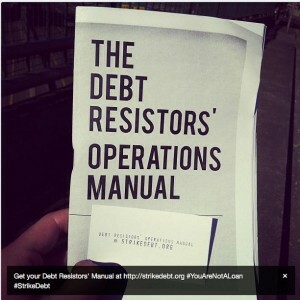 Photo of The Debt Resistors’ Operations Manual at Occupy Utah, from the Strike Debt Facebook page. Stoked by the positive media coverage of the event and Strike Debt more generally — ranging from the New York Daily News to The Village Voice and The Nation — debt resisters took the OWS anniversary in stride. 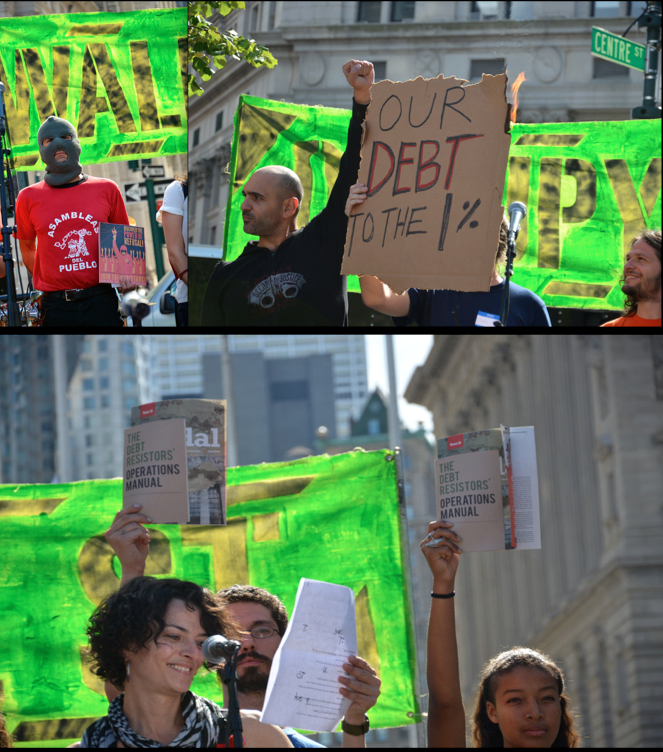 On Saturday, September 16, a large debt assembly was held at Washington Square Park as part of the Occupy Town Square, followed by a release of The Debt Resistors’ Operations Manual (DROM) at Judson Memorial Church that evening. The latter was inaugurated by an 18th-century sermon against usury from Occupy Catholics, which was an important supplement to the DROM event insofar as it inaugurated future collaborations with the faith community around the political theology of a debt jubilee. Strike Debt tabling, OWS Anniversary Convergence, September 16, 2012. We are the invisible army of defaulters. We are the millions of students in default, the millions of households in foreclosure, the millions who cannot pay and will not pay our medical charges and credit card bills to the banks. We are everywhere. The liars and thieves on Wall Street claim we owe them money. They humiliate us. They take our homes, our health, our dreams, our dignity. Out of fear and isolation, we have remained hidden. Now we know that we are not alone. We are not a loan. To occupy is to overcome shame. In Year II, we step out of the shadows. 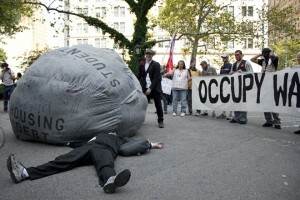 Invisible Army of Defaulters, OWS Anniversary Concert, September 16, 2012. Following the concert, hundreds of attendees made their way from Foley Square across the street to 1 Police Plaza, where a massive Affinity Group Spokescouncil was held in preparation for the “99 Revolutions” actions in the Financial District the following morning. Of the four zones mapped out by S17 planners, the debt zone was the largest, and it included the participation of intellectuals and artists such as Michael Hardt, George Caffentzis, Martha Rosler and concert participant Michelle Shocked (who had earlier begun her musical set with “99 Ways to Loathe Your Lender”). Debt Boulder, September 16, 2012. On the morning of September 17 itself, several hundred debt resisters gathered at 55 Water Street, attached to the global credit-rating agency Standard and Poor’s. Banners, birthday paraphernalia and the People’s Debt Boulder were on hand. The first of several morning affinity groups set out for a nearby JPMorgan Chase lobby in “civilian” mode, a technique developed by the OWS Plus Brigades during Spring Training and the Summer Disobedience School. Accompanied by Michelle Shocked and a number of journalists, the group entered the lobby and tossed hails of red-square confetti while mic-checking a letter addressed to Chase CEO and notorious financial criminal Jamie Dimon written by a victim of the 2008 foreclosure crisis. As the group exited the building after its three-minute intervention in the lobby, we were tackled by a phalanx of NYPD officers in riot gear. Strike Debt action and arrest, JP Morgan Chase building, September 17, 2012.
large-scale action-logics that clearly communicate to a wide public the grievances we have concerning the predatory debt-system and its relationship to economic and racial inequality. When folks put their bodies on the line and risk arrest for an action, that action should match the power of our analysis. Tactical debates aside, moving through the criminal justice system was a lesson in personal privilege and the racial injustices baked into the system we are fighting. Imprisoned on charges ranging from petty theft to subway-fare evasion to unpaid court fees, the consequences of debt, poverty and austerity were evident throughout the stories we heard from non-Occupy prisoners at Central Booking. As members of Strike Debt were greeted by lawyers and a jubilant OWS jail support team after 35 hours of imprisonment, most of our cellmates remained locked underground in the Tombs, their fate uncertain. 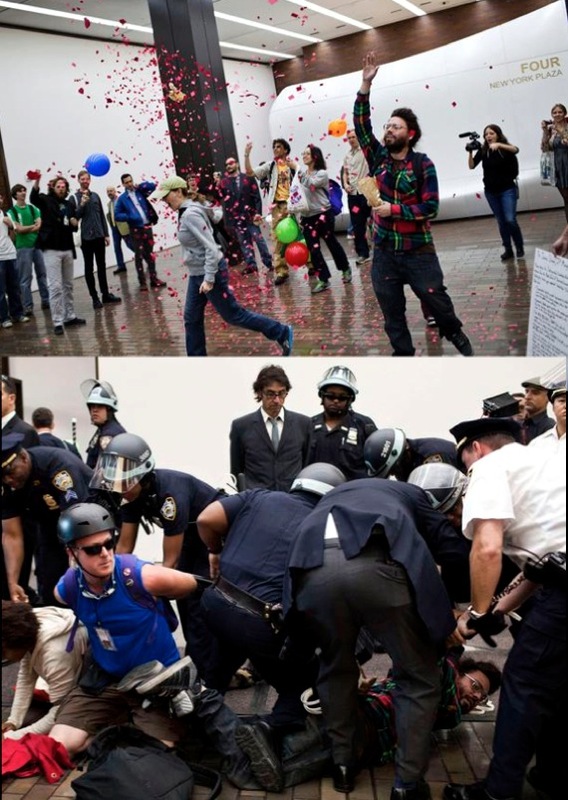 S17 brought new media opportunities for Strike Debt. For instance, I was invited to discuss the circumstances of my arrest on Al Jazeera, where I made sure to plug DROM for an international television audience. On MSNBC’s Up With Chris Hayes, Amin Husain and Alexis Goldstein elaborated on the intergenerational connections between historic social movements such as ACT UP, the trajectory of OWS and the analysis being developed by Strike Debt — the website of which temporarily crashed due to an overload of visits. Meanwhile, a week’s worth of debt-related assemblies and teach-ins took place at the Free University at Madison Square Park, including discussions from Occupy University based on the DROM’s analysis of debt and race, municipal debt and more. Free University provided a space for Strike Debt to decompress and to further cultivate relationships with allies in the student movement. The month following S17 also saw the strengthening of relationships between Strike Debt and the art community, such as through the debt-themed exhibition To Have and to Oweat the Elizabeth Foundation for the Arts. Strike Debt/Occupy University Teach-In, To Have and to Owe exhibition, Elizabeth Foundation for the Arts, October 2012. 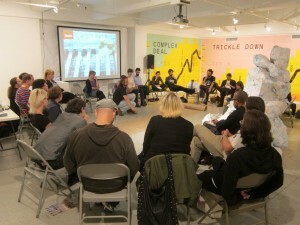 Recalling the synergy between progressive artistic spaces and the work of ACT UP in the 1980s, exhibitions such as To Have and to Owe and the related programming at Momenta Art by Occupy Museums have functioned as a platform for reading groups, meetings, teach-ins and performances — thus helping to incubate a culture of debt resistance. Strike Debt also had a strong presence at the annual Creative Time Summit. Tidal: Occupy Theory/Occupy Strategy was invited to present its work and distribute literature to nearly 1,000 participants from around the world. 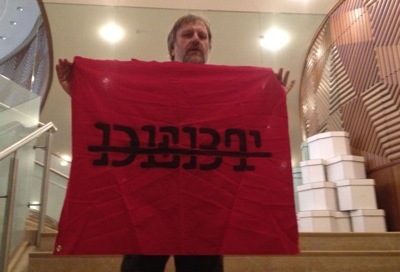 Internationally renown artist Martha Rosler held aloft the DROMduring her keynote address, and communist philosophical impresario Slavoj Zizek posed for a photograph with the Strike Debt red square flag. Slavoj Zizek, Creative Time Summit, October 12, 2012. Participants in the Tidal assembly at Creative Time then made their way to Columbus Circle, the convergence point for the October 13 Global Day of Noiseagainst debt and austerity called in solidarity with the Spanish Indignados, Yo Soy 123 in Mexico and others. Hundreds were in attendance for the kick-off debt assembly equipped with pots, pans and other noisemakers. Then, moving in small, sauntering groups, the assembly converged on 61st Street at the home address of Lloyd Blankfein, CEO of Goldman Sachs; the threshold to the courtyard was immediately lined with police as the first few demonstrators arrived. A mic check addressed to Blankfein detailed his responsibility for the mortgage-backed securities crisis and the $12 billion TARP bailout ultimately received by Goldman Sachs. Debra Thimmesch mic-checking at the residence of Lloyd Blankfein, October 13, 2012. The clamor of the banging pots and pans reverberated up the walls of the residential towers, bringing residents to their windows as so many 1-percenter silhouettes. The massive gates to the building were then closed shut with the help of NYPD officers, highlighting their role as armed guardians of Wall Street. From there the march headed for Times Square, hitting targets including the Plaza Hotel, a Trump Tower, Fox News and Rockefeller Center. Marches, banner-drops, clamorous denunciations of the 1 percent — it all felt good, and proved the benefit of continuing to organize for concerted days of mass protest. But negatively highlighting debt as the vampiric engine of Wall Street profits is only one side of the Strike Debt coin. 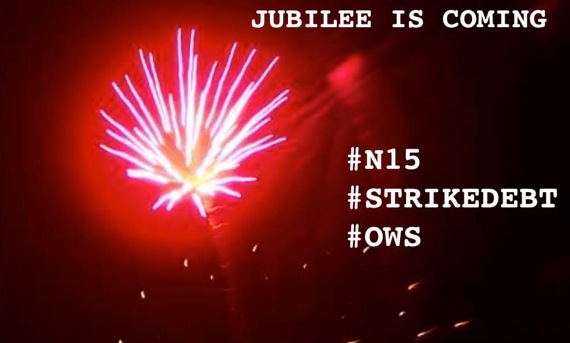 Strike Debt also opens a space for imagining and enacting alternative ways of living without relying on existing authorities — hence the importance of the Rolling Jubilee, in which the people bail out one another rather than waiting for the government to do it. Yet the Rolling Jubilee is but one preliminary tactic in an overall dual-power strategy currently under development. 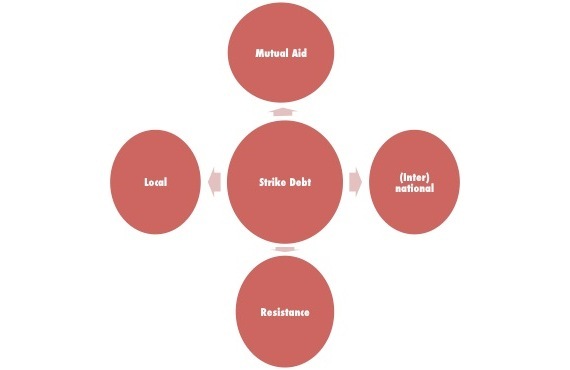 Crucial next steps for Strike Debt will be developing relationships with groups that have long practiced forms of alternative economics, ranging from arts collectives to community-based organizations to religious organizations to gardens to squats to strike committees to workers’ co-ops to credit unions and more. From “Mapping Strike Debt” by Nicholas Mirzoff. Large strategic questions include the problem of national and international scale, alliance-building within and outside OWS, the development of debtors’ clinics and debtors’ unions, the securing of spaces to house critical infrastructure and bring people together, the relationship between the debt economy and climate crisis, the specter of “communization,” and more. As the People’s Bailout approaches, a happy but daunting concern looms: How will Strike Debt absorb growth as it gains more attention? What structures and processes will be optimal for sustaining it? 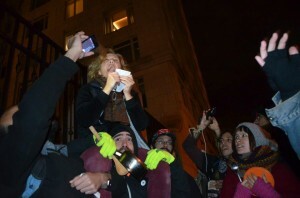 What lessons does the ongoing history of OWS itself offer, and what can we learn from other social-movement histories? This sense of multiple histories was palpable last weekend during the performance of Guthrie’s “The Debt I Owe” at 60 Wall — the sounds of the ’30s, the ’60s and the 21st-century co-mingled in the air. The aesthetic legacy of a figure such as Guthrie is not the only strand of history to which we are, so to speak, indebted as we move into Year II. From the banging of casseroles at Blankfein’s’ doorstep to the special guests joining us onstage at Le Poisson Rogue on November 15, Strike Debt will continue to bring the ruckus to the 1 percent while amplifying the beautiful noise of the people. This is the best article of the Strike Debt! group that I have read to date. Thanks! post then you have to apply these techniques to your won web site.